Alice in Wonderland movies are full of strange characters. There's a White Rabbit who carries a pocket watch, always mumbling about time. There's a fiery tempered queen with hair as bright as her anger and there's a caterpillar that likes to talk in riddles. Our favorite character? Well, that's got to be the Johnny Depp version of Mad Hatter. What's not to love? Wacky orange hair, wackier outfits and Futterwacken dancing! Yeah! If we could dress up like any of the characters from the movie, that's who we'd be. How about you? 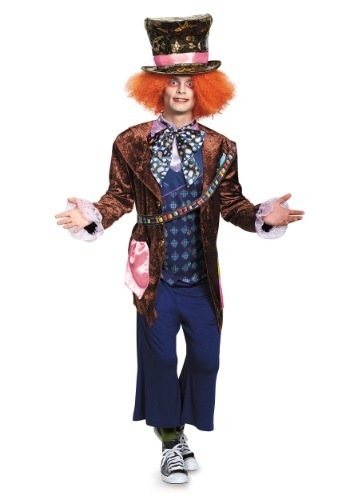 This Deluxe Mad Hatter Costume recreates the look from the 2016 film, Through the Looking Glass. From the lace cuffs to the argyle style patterning on the top, this outfit will have you ready to do a Futterwacken dance of your own! Just make sure to have plenty of tea on hand, since you will be expected to throw a few unbirthday parties for your friends once you're all geared up in this costume.